In a new study, Indiana University scientists found toxic flame retardants in newly manufactured children's car seats, sparking concerns about children's health. Of the 18 children's car seats tested, 15 contained new or traditional hazardous flame retardant chemicals. "New replacement flame retardants, often marketed as safer alternatives, are lurking in children's products without rigorous safety testing and may pose risks for children's health," said Marta Venier, associate scientist at IU's School of Public and Environmental Affairs and principal investigator on the study. "The abundance of emerging flame retardant chemicals in children's car seats and the key role these products play as potential sources of chemical exposure is a cause for concern." Polybrominated diphenyl ethers (PBDEs) were observed in 75 percent of the samples tested, despite being phased out of use in the United States in 2013 over health concerns. However, PBDEs were detected at such low levels that it is unlikely they were added intentionally. They may have been impurities or found in parts containing recycled materials. Conversely, decabromodiphenyl ethane (DBDPE) was detected in four samples at high levels, suggesting that it was intentionally used. DBDPE is a brominated flame retardant known to cause oxidative stress, hormone disruption and thyroid problems. 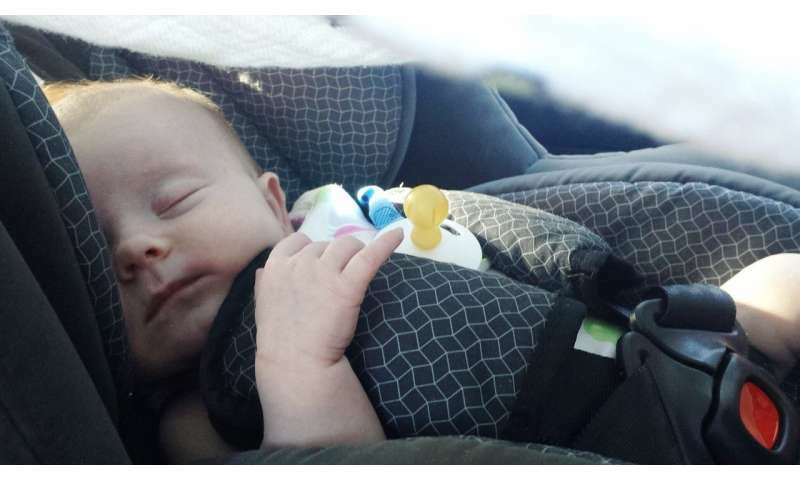 Unlike other baby products, children's car seats are required to meet the flammability standards for car interiors outlined in the Federal Motor Vehicle Safety Standard 302, which was created in 1971 by the National Highway Traffic Safety Administration. Flame retardants are routinely used as a cost-effective way to meet this standard. However, flame retardants have been linked to a variety of negative health effects, including hormone disruption, impaired brain development, liver damage and cancer. Children are more susceptible to these effects than adults because of their smaller size and their tendency to put their hands and objects in their mouths. "Children's Car Seats Contain Legacy and Novel Flame Retardants," was published in Environmental Science & Technology Letters.